Hi ! 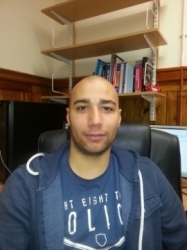 My name is Adam and I am currently a PhD student at the University of Dundee under the supervision of Dr David Keeble. I graduated from Dundee in 2013 with a first class Bsc (Hons) Physics degree. This PhD was my first serious foray into Magnetic resonance as I had only ever touched on some of the theory in my bachelor’s degree. I spent a significant portion of time in the first year on building up my knowledge to an adequate level. This is always ongoing and I am learning new things every day. I mainly do CW X-band EPR on a Bruker EMX spectrometer looking at various Perovskite piezoelectric materials such as SrTiO3 and PbTiO3 etc. We are particularly interested in the defect dipoles created in these materials when they are doped with transition metals. These defect dipoles occur due to ionic charge compensation as a result of the dopant material having a different charge to the host ion. Further details of my ongoing projects can be seen in my subpages above. I am also a teaching assistant for the 2nd year physics students and have very recently became a private part time tutor for high school Maths and Physics.